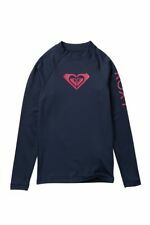 Roxy Girls Size 10 Rash Guard Swim Shirt with an Ultraviolet Protection Factor of 50 . Sun Protection Factor: UPF 50 . Pull-over style. High neck. Short leeves. Roxy logo on the back of shirt. Roxy Style Number: 803020S. Roxy Girls Sea Bound Short Sleve Shirt Chambray/Sea Foam. 92% Polyester.